Early Vetter designs are coveted collectors items. Vetter was one of the very first companies to make fairings in the US. These fairings led directly to the fully faired super sport motorcycles of today. Feature | Craig Vetter is doing better. On August 12, 2015, he hit a deer about a mile from his house in Carmel Valley while riding his fully streamlined Honda Helix. He suffered a traumatic brain injury and required three rounds of brain surgery to survive it. The wreck has understandably slowed him down. 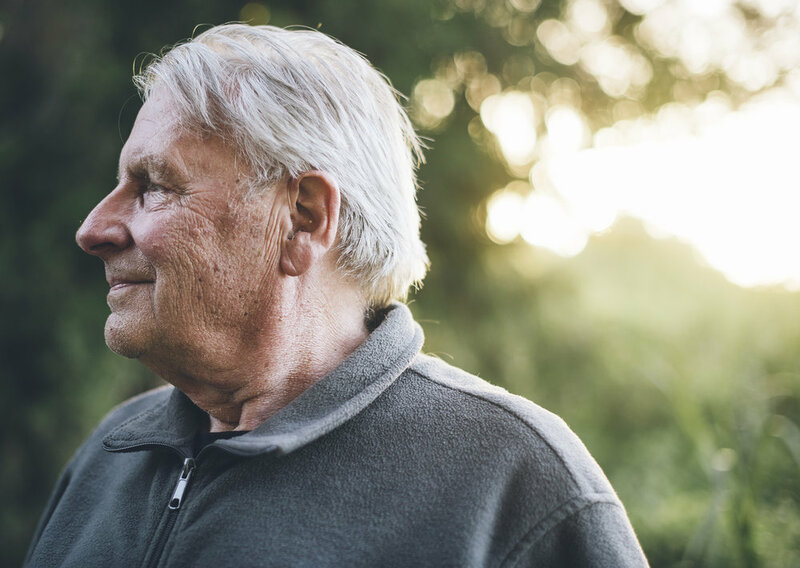 However, in the last nine months, with the help of his wife Carol and sons Zak and Morgan, he has made remarkable progress and is back working on his biography. 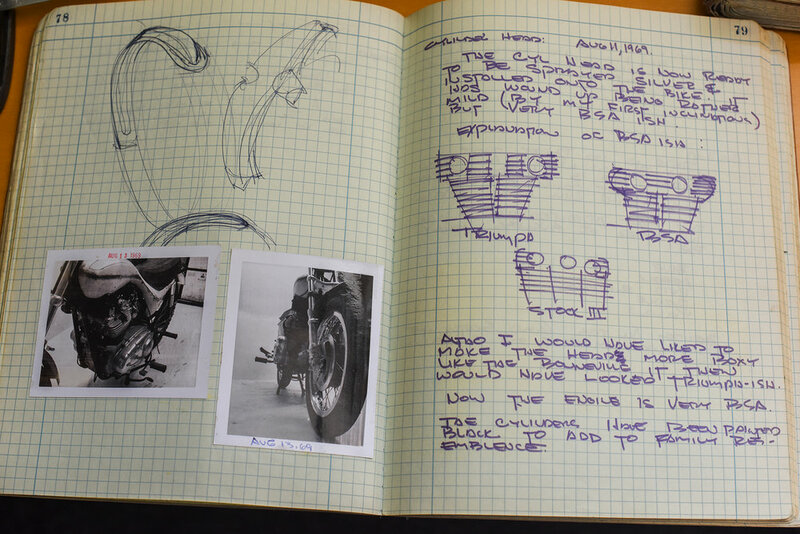 Vetter, 77, is one of the seminal American motorcycle designers and stylists of the 20th century. At one point, the Vetter Fairing Company was second only to Harley-Davidson in the U.S. motorcycle market. His hugely successful Windjammer series of fairings alone would give him a place in moto history. When you add in his brilliant 1969 redesign of the BSA Rocket lll, which appeared in 1972 as the X-75 Triumph Hurricane, and then throw in his redesign of the oil-in-frame Triumph Bonneville, we are talking about design greatness. Vetter was a pioneer in so many ways. When he started making fairings in 1966, he was one of the first people to even build fairings in the U.S. His early fairings, the 500, 600, 800, 1000, 1500, 1600, 2000, 2500 and Phantom series, are coveted collector items. The Windjammer and the Vetter-designed luggage kits set the stage for the whole world of touring motorcycles as we know them today. Honda took one look at what he was doing and got him to design fairings for them. Vetter and the Rickman Kawasaki on which he came third at Daytona in 1976. Vetter was the U.S. Rickman importer from 1973 to 1976. Photo courtesy of the Vetter archive. From 1966 through 1983, when he sold his company, Vetter was at his most prolific. He was the importer for Rickman motorcycles. The output of the Vetter Fairing was doubling in size almost every year. He designed and put into production the outrageous Mystery Ship hot rod bike. In 1980 he crashed his ultralight plane and broke his legs. In response he started a new company, the Equalizer Corp., and designed very successful racing wheelchairs. He took his knowledge of fiberglass and started a company making hot tubs and spas. It just goes on and on. And he raced. Riding a Rickman-framed 1100cc Kawasaki, he came in third at Daytona in 1976 in the amateur production/cafe racer class. Later in ’76, Vetter came off his RD350 in a race at Road Atlanta and suffered significant leg injuries. He returned as a team owner in 1978 with Reg Pridmore riding the Vetter Kawasaki and won the AMA Superbike championship. Pridmore rode the team’s Pierre Des Roches-tuned Kwaka in ’79 as well. In 1980, Vetter began devoting himself to streamlining motorcycles for speed and increased fuel economy. The Vetter Fuel Economy challenge is recognized for pushing the limits of hyper-efficient motorcycle design. His Rifle fully streamlined motorcycle fairing is still available. He is very interested in electric motorcycles. 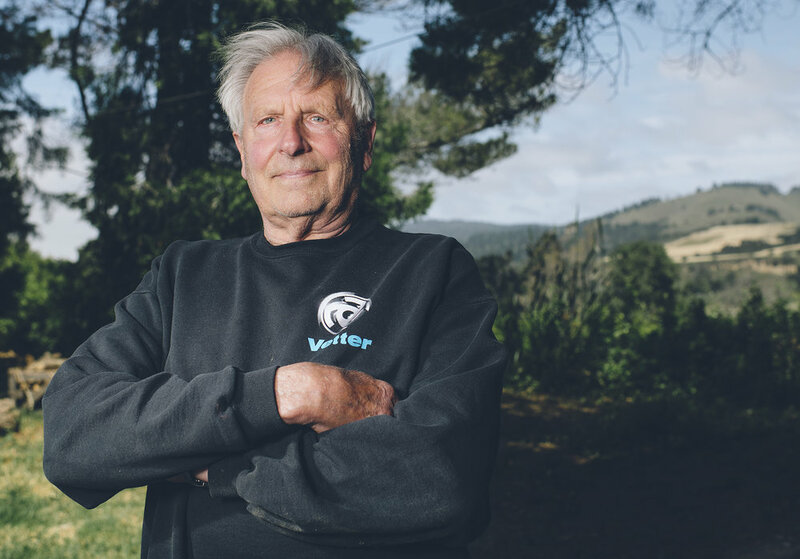 His son Zak is actively involved with a company working on electric motorcycle chargers, and Vetter is keeping a fatherly eye on the work as it progresses. I ran into Vetter at the Quail Motorcycle Gathering, and he graciously invited Rust to visit his home and workshop to talk motorcycles and design. Vetter started right off with his story before we asked any questions. And it is a remarkable story. The Honda Helix based streamliner that Vetter was riding when he struck a deer. The dent in the bodywork above his name is where the deer hit the bike. Vetter says this is his favorite bike. Craig and Carol Vetter. Carol had a long career at Vetter Fairings and is an avid motorcyclist herself. One of the most important parts of streamlining is putting the airflow back together smoothly. Rust: One of the things I am impressed with is how relevant the Vetter fairing, the Windjammer fairing, still is. It elicits strong feelings one way or the other. Some people hate it; some people really love it. It’s become an industry icon. How do you attribute the fact that it is still such a relevant thing and it hasn’t even been produced for 30 years? '70s horse power, the Mystery Ship hot rod face to face with the Vetter Kawasaki which Reg Pridmore rode in the AMA Superbike championship. Photo courtesy of the Vetter archive. Rust: Do you ship them from here? Rust: I love the part of your website that is all of your customers who have sent in pictures and letters talking about their fairings and their experience with it. Rust: It’s addictive to go through that and read each of those guys’ stories. Rust: As far as design goes, I think you are one of the great American designers. Details of the seat and tank unit as well as notes on the exhaust and color of the bodywork. Vetter even looked at re-doing the finning on the cylinder to compliment the look of the bike. Rust: It is such a strong mantra throughout your work. When did you develop that concept and that saying, the philosophy of doing more with less? Vetter: “It came out in school and shortly after school. I used to go to design lectures and I came across probably the greatest designer in the world ever. I learned that he was and I started to attend his lectures. I called him up one night at one in the morning. I called him up one o’clock or so and I said, ‘Is this Bucky?’ Buckminster Fuller was his name. He is, as far as I’m concerned, the greatest inventor, designer, thinker the world has ever made. I was thinking of a better way to build a tetrahedron, and I said, ‘What do you think?’ and he said, ‘Oh, it’s a great idea.’ So we had a nice little talk. The guy was already older than me right now probably. (chuckling) He was the guy who said, ‘Do more with less,’ which I liked a whole lot. It verbalized something I was thinking. I was just fresh out of school; no one ever taught it to me, but it was something I thought was important. I went to see him at a design conference at Aspen maybe six years later. Aspen is a big design conference in Colorado and I would go to it every year on my motorcycle. It’s like 1,300 miles from where I work. Buckminster Fuller was the big speaker that year. Rust: One of the things I like about your designs is that you obviously took into consideration aerodynamics. The most pointy-looking motorcycle, the raciest looking motorcycle has the worst aerodynamics. A bus had better aero than a GSXR. Vetter: “It’s real simple. In 1957 the FIM, they controlled all motorcycle racing in Europe, and fairings had got to the point by 1956 or so that they were becoming aerodynamic. Round in the front and pointed in the rear. And as they did they were going faster and faster. These things were going so fast with their little engines that drivers were getting scared of them. They were on tracks that were not designed for 130 miles an hour. No one ever did it. Their cambers were off and they weren’t smooth and the tires on the bikes were never set up for 130. The track people didn’t want to change their tracks. The bikes themselves weren’t up to it. They didn’t have the right tires; they didn’t have the right brakes; they didn’t have the right engine cooling. What did they do? They just cut away the streamlining. Rust: How did you make the leap to working for Triumph? Vetter: “They called me. I had designed this really neat seat/tank for my Suzuki 500. It was real long, held about six gallons. I parked it and one of the Triumph guys said, ‘Could I buy your new 1600 fairing for my Triple?’ I said, ‘Sure. What are you going to do with it?’ He said, ’I’m going to drive it to Daytona. You ought to come down, too.’ So I went. This guy from Triumph, he says, ‘Where you want to park?’ I said, ‘You know, I’d like to park down there where all the race bikes are.’ He says, ’I do that, too; come park with me.’ So I have this picture of my Suzuki with his Triumph with the fairing on it all surrounded by Gary Nixon and Gene Romero. One of the salesmen from Triumph saw it and, I wish I could tell you his name, and he was stunned by it and he talked to his boss, Don Brown. Brown was with BSA and this other guy was with BSA, too. And he said, ‘Boy, I saw this thing that a guy had made for his Suzuki; it was really neat.’ And so Don Brown was kind of a free man at BSA and he was in charge of their sales, but he could see that what BSA was selling, was bringing to America; it was missing a little bit of what Americans wanted. Not really on. He told me that the designers at BSA, they don’t really, they don’t get what we want here. Don Brown called me three months after Daytona and said, ‘Come out and visit me.’ He said, ‘We want to know if you can design. ‘We’ was him; it wasn’t anyone else; it was him. He said, ‘I want to know if you can turn this BSA Rocket lll into a bike that Americans would want.’ And it was private. Even though he gave me a bike, a Rocket lll, to drive back to Illinois. It was a terrible bike. There were good things about it, but mostly it was big and heavy. You sat up real high with it. It was very European. The bike had been done by a company called Ogle Design in England. They did the BSA and they did the Triumph triples. So I drove it back to Illinois and went to work on it. What I wanted to do was Americanize this English motorcycle. ‘Cause the engines were neat, you know, and the frames were OK. It was the end-time look on the thing. Ogle had done this look to it. So I just threw that stuff away and made it what I thought was very American. It was radically different. It wasn’t anything like the original Rocket lll. The original had a square gas tank and a giant square seat. No American liked it. Nor did I. I built a very American motorcycle shape, American seat, very American about how we like to ride. The British would ride this way, OK? (drawing a straight horizontal line in his notebook). You have the seat, side and tank. Americans always like this (draws a shallow V). We always sat low in the center with the forks out like this. The Europeans like straight. They always did straight stuff. Whereas Americans, we like Harley-Davidson; we like this (pointing to the V shape). Rust: So when you did it what was their reaction to it in England? Vetter: (laughing) “The young people loved it. See, the Triumph factory in England was a real sad situation. At the very top were guys in three-piece black suits who came to work in Rolls-Royces or Bentleys. They did not ride motorcycles. And when they went out to the factory they didn’t really want to go out there. In the factory were a bunch of guys that looked just like me. They had long hair and Levi’s and stuff and they looked just like me. The younger the person the more they liked what I was bringing them. They saw it. The older persons thought that I had brought in some kind of hippie-design stuff that was going to come and go. It was not going to be around. Whereas they were doing classic stuff that had been around forever in England. Rust: How did the Mystery Ship come about? Vetter: “Mystery Ship first came about in ’73 or so. It was very early in my business. The idea was to develop the dream touring bike. The dream touring bike would have the dream look and be comfortable and stop the wind. It had everything streamlined and it would be the ultimate fairing for crossing the country. I fussed with it and fussed with it. I have pictures and sketches of all this. Making fairings, staying current with fairings; I was doubling every year, was taking all my time. So even though I wanted to make the dream touring bike, it was not important enough to spend all my time doing. It was interesting how in ’75 we became Rickman’s American dealer. The word was that they just handled really well. So I began doing Mystery Ship stuff on the Rickman frame. 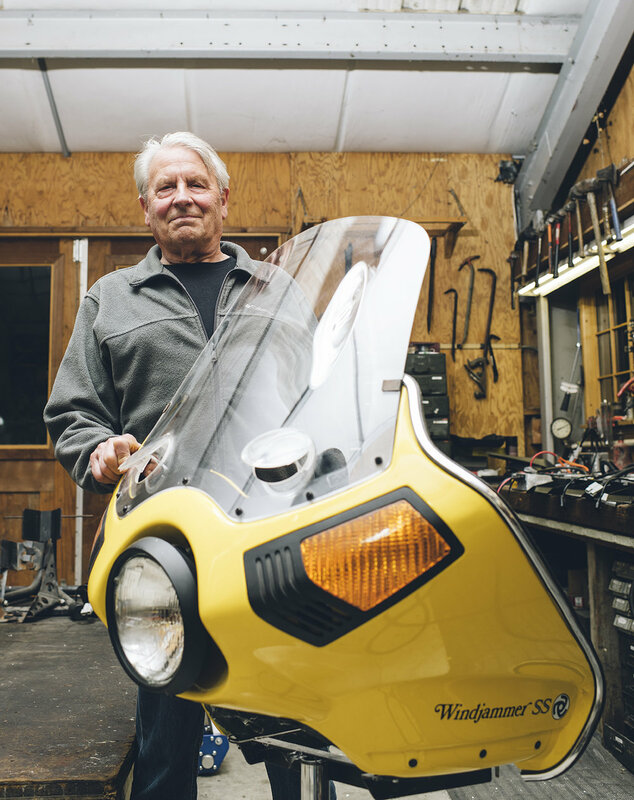 Craig Vetter in his shop with the iconic Windjammer SS fairing. Still one of the very best touring fairings available. You can still buy trim pieces for the fairing from Craig Vetter. In ’76 I crashed on my Yamaha in Atlanta. It stopped me from racing. I got third at Daytona that year. The Rickman was a racer, not a touring bike, but nonetheless it is associated because people think, ‘A touring bike? That guy’s a racer; this ought to be really good,’ which is what I thought, too. So I didn’t do anything on it for a couple years. I started again on it when I moved to California. I decided now the Mystery Ship would not be a touring bike, it would be a combination racer and street bike. I talked to Derrick (Rickman) about it. I already had a racer so it wasn’t much to talk about. It was going to be Rickman (frame)-based and a street hot rod is what it was. It was going to be based on a Kawasaki, which were 903s to start with and became 1000s in no time at all. I was now living in California and I had a lot of West Coast contacts that I had made over the years. I was in San Luis and I’d go see Sandy Kosman, who was a frame maker over here, and let’s see who else, and Darryl Bassani, who was doing exhaust pipes, and Harry Hunt, who did aluminum discs, and Tom Lester. He was making aluminum wheels so I put aluminum wheels on ‘em. Oh, that’s not true. I was going to but I put alloy mags ‘cause they were real, real light. So this Mystery Ship was like a one-person street bike. It had a good fairing on it and good streamlining but it was clearly a race bike that you could ride on the street. It had lights on it. Vetter inspecting his damaged Yamaha RD350 after his crash at Road Atlanta in 1976. Photo courtesy of the Vetter archive. So I quit the Mystery ship and decided to make wheelchairs. Really, really exotic wheelchairs. After 10 Mystery Ships that was it. One of the magazines did a test, Bimota against the Mystery Ship. I think they liked the Bimota more because it had more hand-built parts on it, but they liked them both. One was very European and one was very American. Rust: When you did it, did you do any aerodynamic testing? I’ve seen pictures of you doing tuft testing and things like that. Vetter: “Not with that. I already knew; I already understood how important streamlining was going to be. It was not going to be that important. Because what was important here was making a really fast, reliable, good-looking, ‘Wow, look at that!’ street hot rod. That’s what it was. So the whole idea of going in a wind tunnel and making teardrop-shaped streamlining was not a part of that. Rust: I recently saw a red turbo Mystery Ship that was for sale. A lineup of Triumph Hurricanes capped by one of two turbo charged Mystery Ships. Only 10 of the of the Kawasaki based bikes were ever made. At the rear of the lineup is a BSA Rocket lll, the bike Vetter was asked to redesign to create the Hurricane. Photo Courtesy of the Vetter Archive. Rust: Did you have a problem with lift on the thing? Vetter: “I never had a problem with lift. But Wes Cooley was riding with me down at Riverside. We had it down there and I wanted to see what real riders thought about it. Wes Cooley was one of the real riders at that time... His comment was, ‘Craig, I think you have some lift in this thing.’ My next job was going to be to figure out how to make that go away and still keep this aggressive kind of a look. But I just gave it up. I gave the whole Mystery Ship up. It was going in the wrong direction. Rust: At road speeds it was fine. Rust: Do you still have one? Rust: It is such a statement motorcycle. I think it’s cool that you only made 10 of them. Rust: I am interested in what your opinion is of the motorcycle’s future in a world of autonomous vehicles.